Sassy Lassie Reviews: Business Card Giveaway! With today's fast pace life style it is hard to keep up with everyone's contact information . Add the explosion of social media and it adds to the difficulty. When I meet someone for the first time I often ask them if they have a business card. It's quick, easy and contains all the information I want in one spot. Need some new cards to pass out to business contacts, friends or associates? Look no further! 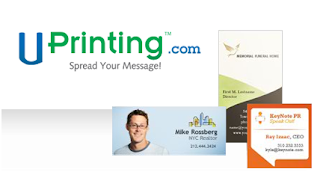 I am happy to announce that I am offering one lucky winner 500 business cards courtesy of UPrinting! Yes, that's right - 500 business cards. You will have your choice of sizes: 2 x 3.5, 2 x 3, 2 x 2 or 1.5 x 3.5. The cards will be printed on 14 point gloss or matte card stock or you can choose the 13 point recycled uncoated card stock. the cards can be full color on both sides and will be printed in 3 business days. PLUS you get free UPS ground shipping! What more could you ask for? How do you win? Easy! Just leave a comment to be automatically entered in the drawing. Want a second chance to win? Tweet about the giveaway and include @sassyirishlasie or leave the tweet in the comment section. The winner will be randomly chosen by Random.org on March 29th and must be a US resident. Have fun designing your business cards and good luck! Happy Friday!Visiting from VGNO.......Nice to "Meet" you! Oooh! Business cards!! How cool!! I love UPrinting - I used to use them for my business cards when I ran my daycare.